Nuxeo today announced the immediate availability of LTS 2019, which delivers the latest features and functionality to the low-code Nuxeo Platform. With major enhancements in areas such as artificial intelligence (AI), integration to leading productivity and creative applications, and extended content connectivity options, LTS 2019 reinforces Nuxeo’s focus on helping enterprises transform their businesses with content and data. Strengthened AI framework. A streamlined pipeline is now available to make building and training AI models much more accessible. Nuxeo customers can employ custom data models as well as train 3rd party AI engines (i.e., Google Vision, Amazon Rekognition or Amazon Comprehend) on their own data sets to deliver real business insights, even on business-specific content. Federation Blob Provider: The Nuxeo Platform can now manage binary content “in place” (i.e. content stored in external ECM or EFSS systems). In addition to extending Nuxeo’s content federation strategy, this enables its customers to get all the benefits of a modern CSP (scale, search, workflows, automation, permissions) without the cost and pain of forced migrations. 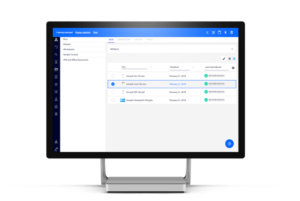 Office365 Integration: Nuxeo users can now benefit from advanced metadata management capabilities, deep AI functionality, powerful search, permissions management, and more – all while transparently editing files from within the Office 365 suite. Enhanced Annotation Capabilities: LTS 2019 includes enhanced capabilities for annotations, including the ability for users to annotate office documents, images, videos, and PDFs for review/validation processes or for media enrichment. New Adobe CC Connector: A new Adobe Creative Cloud connector has been rebuilt from the ground up to improve the user experience and leverage the full capabilities of Adobe CC 2018. Pluggable Accelerated Transfer for Upload Services: Nuxeo can now be easily plugged into any direct upload service that provides file or object transfer acceleration. As a result, Nuxeo users will enjoy faster uploads of large content assets like 4K video files via Web UI (the Nuxeo Web client). Transfer acceleration is now available for AWS S3, and connections to additional services can be easily created (such as for Azure or other specialized vendors). Identifying Similar Content: Nuxeo now supports “More Like This” type queries, which enables intelligent searches across a repository for content that’s close to the content of a given image, document, case or other business object. This is particularly useful in case management projects where finding similar cases can reduce resolution time. Bulk Actions Framework: Nuxeo has streamlined bulk operations with a Bulk Action Framework built on a Kafka-based streaming infrastructure. This allows customers to execute custom actions on millions (or even billions) of content items easily, and in a highly-scalable and robust manner. This can be particularly useful for enterprises that have high-availability solution requirements, or that have specific needs around bulk or volume processing of content or data.